Goodreads says, "In the unforgiving Mesopotamian desert where Jayden’s tribe lives, betrothal celebrations abound, and tonight it is Jayden’s turn to be honored. But while this union with Horeb, the son of her tribe’s leader, will bring a life of riches and restore her family’s position within the tribe, it will come at the price of Jayden’s heart. Then a shadowy boy from the Southern Lands appears. Handsome and mysterious, Kadesh fills Jayden’s heart with a passion she never knew possible. But with Horeb’s increasingly violent threats haunting Jayden’s every move, she knows she must find a way to escape—or die trying. With a forbidden romance blossoming in her heart and her family’s survival on the line, Jayden must embark on a deadly journey to save the ones she loves—and find a true love for herself. Set against the brilliant backdrop of the sprawling desert, the story of Jayden and Kadesh will leave readers absolutely breathless as they defy the odds and risk it all to be together." The setting is ancient Mesopotamia and Jayden is betrothed to Horeb, future king of her desert nomad tribe. She should be thrilled, because Horeb is a childhood friend and extremely good looking, but he has changed. He's cold, selfish and an all-around bad guy, so Jayden is dreading their upcoming marriage. Top top it off, Horeb deserts her when she needs him the most and while during this turbulent time she meets Kadesh, who seems to appear out of nowhere. Her family helps him and in turn, he does the same for her family. A forbidden love blossoms between the two, but how could she allow this to happen, especially since she is promised to Horeb? To make matters worse, Leila, her sister, wants to leave her life as a nomad and live scandalously at the Temple of Ashtoreth. It feels like Jayden's family is falling apart. Can she really risk it all for Kadesh? Things really get stressful when Horeb finds out how she feels about the stranger, Kadesh. This action packed young adult debut kept me on the edge of my seat. It was definitely one thing after another for Jayden, but Forbidden by Kimberley Griffiths Little was a roller coaster ride I enjoyed being on. Little did a great job creating multi-faceted characters in Forbidden. Jayden was a feisty heroine, torn between doing what is right for her family and doing what her heart wants. Things become easier to navigate once she figures out how horrible Horeb truly is. Kadesh, the mysterious stranger, was definitely a swoon-worthy hero in Forbidden. I enjoyed their blossoming romance in the novel, but there were many heart-wrenching scenes between the two as their love isn't exactly conventional since she is already betrothed. Jayden's family also plays an important role in the novel and I especially liked her relationship with her grandmother. Just as there were heartbreaking scenes with Kadesh, there were many with her family as well. Needless to say, Forbidden tugged on my heartstrings. The setting of ancient Mesopotamia was really captivating. I am sure it was that historically accurate, but it was unique nonetheless. I can't say I have come across this setting too often, so I enjoyed that aspect of the novel. Being a desert nomad was also intriguing and made a life of adventure for Jayden. Since the setting is in the Middle East, the importance of dance and traditions were also an intriguing aspect in Forbidden. If you like historical fiction with a lot of action, a complicated romance and a unique setting, check out Forbidden this winter. It's definitely one of my favorite historical reads of the year. I'm glad you enjoyed the story and that is pretty high praise if it is one of your favorite historical novels of the year. Haha. I read in a few reviews that people had issues with the character's names. If you can get past that, I think you'd like the adventure in this story, Christina! Thanks for visiting! Thanks for sharing this review! 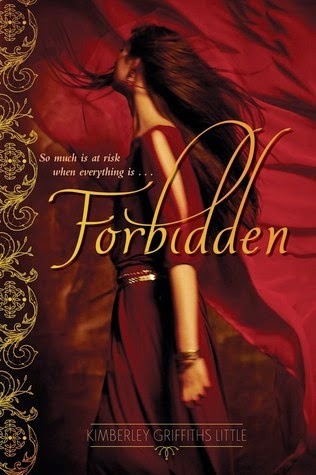 We had Kimberley Griffiths Little here as part of her book tour, and she was lovely and interesting, so I've been looking forward to picking up Forbidden. I hope you like it! Let me know your thoughts. Thanks for dropping by! I was just making a best of 2014 list and thinking that I have read less historical fiction this year. This sounds intriguing -- I haven't read anything set in Mesopotamia! Yes! The setting was pretty fantastic and a selling point for me. I hope you get to read this one soon, Jen. Thanks for visiting! Wow I love the sounds of the setting, the dancing and music, and the love story! I'll definitely have to check out this one soon! You should definitely check it out, Becky! The setting is so unique that I was completely sucked in. Thanks for visiting, Becky!